Ryan Ludwick – If only someone had tipped off the fantasy community weeks ago about Ryan Ludwick – if only…Over the last seven days, Ludwick, in going 11/25 with three bombs, reminded everyone of his brilliant 2008 season. Ludwick can hit .250 with 25 jacks – he might fall a tad short, but he’ll be close. He’s a very cheap and usable outfielder. All of you who jumped on Gomes should jump on Ludwick. Justin Turner – Turner! The former Orioles/Mets/Reds prospect was my pick to win the “coveted” Mets second baseman job. Over the last seven he has earned a little bit of rope, going 10/25 with a homer and 10 RBIs. In 2011, he has almost appeared in more games than in the rest of his career, so there isn’t much to go on with Turner. For the Mets, in AAA, Turner has faired well. For the Orioles, in AAA, he didn’t do as well. He does own a .307/.368/.440 line at AAA and has been a career .300 minor league hitter. Turner is the definition of NL-only option – and not a bad one at that. If he can continue to get playing time, he should bat .280 with minimal pop and minimal speed. Think of him as a sort of Scott Sizemore-lite, albeit with a better batting average. Cody Ross – I’ve long enjoyed the career of Ross. It’s nice to see him get back in the swing of things (4/14 with two homers over the last seven days). He isn’t quite playing everyday, but he is getting enough at bats to be NL-only relevant. If he starts to get more run, he has sneaky streaky power – so he is definitely someone to keep an eye on. Brad Hawpe – Apparently the CDC put out their Zombie preparedness kit just in time, as, clearly, Hawpe is a member of the undead. Over the last seven days, Hawpe went 8/21 with a dinger. Over the last 30 days, he is hitting a not-laughable .293 with two homers. Am I buying it? No, if you’ve seen 28 days later, eventually zombies run out of sustenance and turn back into dead things. If Hawpe ends the year with more than 13 HRs and a batting average above .240, I’d be surprised. Marlon Byrd – I’m a Marlon Byrd fan – I own him wherever it makes sense (deep 10-teamer, NL-only, etc.). He’s just a solid player. Over the last seven days, he was a tad more than solid with two homers and .348 average. This doesn’t really change his outlook though. Byrd is a .290-.300 hitter with moderate power (think 10 more HRs) and little to no speed. He hits in a decent spot in a decent order in a decent park, so 70 runs/RBIs are possible. He is a usable, non-flashy player. Trevor Plouffe – When @JoelHenard and I did our Twins radio preview, I said that the twins would need Trevor Plouffe to succeed if they were going to compete. The reason being the rest of their middle infielders are horrendous. Plouffe, with scant minor league success, got the call this year and went 7/25 with a homer and seven RBIs over the last seven days. He was showing some flashes in AAA this season (however it was his fourth stop there) and is currently hitting .286/.381/.514 in the bigs. I don’t think Plouffe is all that good (7.1% line drive rate), however I wouldn’t be shocked if he hit .260 with 10 HRs. Chris Heisey – People love Heisey – trust me. And, really, what’s not to love with a guy capable of going 4/9 over a seven day stretch (well a lot of people can and have done that). On the year, Heisey has a .274/.347/.500 line, yet he doesn’t see much playing time in an incredibly crowded Reds outfield. In deep leagues, it is time to add Heisey – if he gets at bats (and signs seem to point to him getting more PT), he could hit 15 HRs and swipe 10 bags. That’s pretty tasty. Mark Ellis – I’ve been a Mark Ellis fan for awhile – great defender, bad luck with health. Over the last seven days, a currently healthy Ellis went 8/27 with six RBIs. In 2007, Ellis hit 19 homers. He is now 33 years old, going on 34. There’s not much there with Ellis. He isn’t as bad as he has been, but he doesn’t walk at all and his power has disappeared. With a wink and a smile he could get to 10 dingers, but single digits is way more likely. Tyson Ross – Ross had a memorable outing this past week: 7.1 IPs and eight Ks. Sure, it was the White Sox, but whatever. On the year, Ross has a suitable 2.75 ERA and 3.66 xFIP*. No matter how you slice it, he’s been effective. But, how effective can he be going forward? Well, he isn’t getting a ton of swinging strikes, is getting lucky on HR/FB and is allowing a somewhat high line drive rate. He might post a good K/9 rate (6.5 or so), however he has always walked a lot of guys. I don’t think Ross is relevant for many leagues. *Update, nothing to see from the above as Ross has been placed on the DL. Dillon Gee – Gee makes his second appearance on Katy’s All-stars. He had a killer seven day stretch: 12.2 IPs, nine Ks, a 2.84 ERA and 1.11 WHIP. In a cup of coffee last year, he barely struck out more batters than he walked. So far, this season he has increased his K rate to something similar to his minor league success. In the Mets ballpark, he’ll post a good HR/FB rate, but he’s not a sub-4.00 ERA pitcher (.242 BABip). Still, he isn’t giving up a ton of good contact so he could stick. I imagine he’ll post a 6.75 K/9 rate and 4.25 ERA. Not bad. Josh Collmenter – Collmenter was straight dirty over the last seven days: no runs in 12 innings and a 0.33 WHIP. So far, in his first 26 IPs, Collmenter has a 0.69 ERA – that’s damn impressive (so to is his .155 BABip and 95.2% strand rate). He has a decent swinging strike percentage but is mainly a fastball pitcher – and his fastball has been 87.5 MPHs this year. He’s not going to be useless going forward, but a 4.10 ERA and 6.10 K/9 rate would be a tad optimistic. 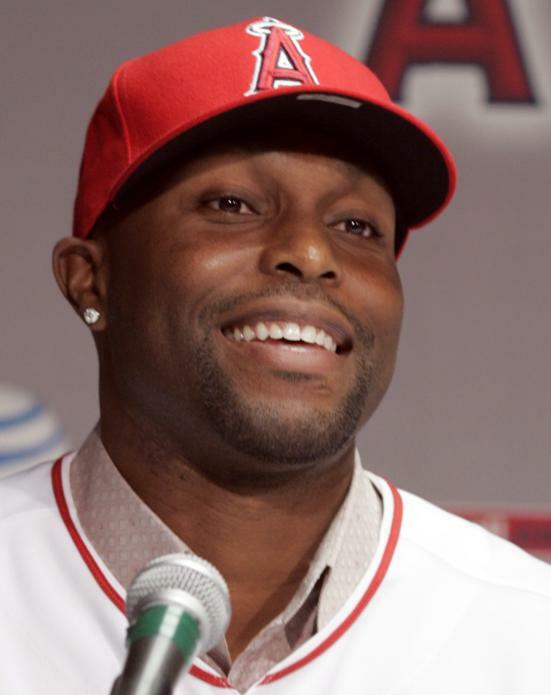 Torii Hunter – It’s not hard to see the signature Hunter smile fading a bit, especially as he went 1/24 over the last seven days and is now hitting just .218. Since joining the Angels, Hunter has been remarkable steady, hitting 21, 22, and 23 HRs and batting between .278 and .299. However, things seem to be going bad for the 35-year-old outfielder. His Ks are up a tad and his power is down a lot. However, his line drive rate, swinging strike rate, and contact rate are all relatively normal. He is hitting a few more ground balls and a few less fly balls, but it’s nothing crazy. Yet, his .254 average on balls in play is far lower than at any point in his career. I don’t think this is the end for Hunter. He might not be able to get his average up to where it has been, but he’ll finish as a .255 hitter. He’s also good for 15 more HRs and 10 more steals. I believe in him. Mike Aviles – The infield wunderkind has been anything but lately (2/20 over the last seven days, and 20/79 over the last 30). Typically a decent hitter, Aviles now has a .234/.269/.444 line. However, Aviles isn’t swinging and missing anymore than normal, nor is his contract rate suffering. He isn’t hitting the ball all that well however (11.7% LD) and seems to want to jack everything (49.5% fly ball rate). Sure that will help with homers, but he’s not the type to post a .200+ ISO. If Aviles gets back to his line drive hitting ways, he could end up a nice player. However, many a man has fallen prone to the long ball siren’s call. Conservatively, I think he can hit about eight more homers and steal about eight more bases – however, the batting average might not be there. As someone who qualifies at all the relevant IF positions, he’s useful to have around. At this point, he’s not as valuable as Chone Figgins, though. Kelly Johnson – Johnson can do no right this year. Over the last seven days, he is 4/27 and that barely lowered his dismal average. In 2008, Johnson posted a .340 BABip. In 2009, he had a .247 BABip. In 2010, he had a .339 BABip. This year he has a .243 BABip. He is also striking out a ton this year and not walking as much. His swinging strike percentage is way up and contact rate down. As you’d bet, his line drive rate has suffered considerably and he is hitting more balls on the ground. I still don’t think he is this bad and is a decent bet to go 15-15, however if he ends up with an average over .250, I’d be shocked. Still, if he goes .250/.330/.420 the rest of the way, he’ll be useful. Mitch Moreland – How can I have some more land if I haven’t had any land to begin with? Ok, maybe that didn’t work – whatever. Moreland wasn’t great over the last week (3/17). And if you check out his game log, he hasn’t been seeing full time at bats (and wont for the entire year). He’s a decent option, capable of going .275/.340/.450. However I’d be shocked if he got more than 600 ABs, which would make it hard for him to hit 20 HRs or knock in 75+ runs. Bud Norris – As the leader of the Bud Norris fan club, I hope you took my warning that things fall apart a lot with him. Last seven days: 12.1 IPs, 12 Ks, 6.57 ERA and 1.46 WHIP. It’s just what will happen all year – up and down, topsy-turvy, with little rhyme or reason. Still, he’s going to post a 4.35 ERA and a 9.5 K/9 rate – so you just got to take the lumps when they come. He isn’t droppable. Bronson Arroyo – Arroyo was not helpful last week: 13 IPs, 5.54 ERA, 1.38 WHIP and just seven Ks. However, on the season, he has been pretty decent: 6.32 K/9, 4.11 ERA, 3.89 xFIP. Still, he’s not that special of a pitcher and his ballpark does him no favors. He’s a fine staff filler, but not elite at anything. Wade Davis –Davis was worse than Arroyo over the last seven days (4.85 ERA, 1.62 WHIP and just six Ks in the same amount of innings). He has been terribly lucky on the season with that 3.47 ERA almost a total mirage. Right now he walks as many batters as he strikes out and that just wont work. He isn’t getting nearly as many swings and misses as he is capable of. I’m not a believer inDavis until he flashes his minor league K-rate and gets back to going after hitters. Fausto Carmona – I’ve never been a Carmona fan – if he’s bad there’s no K help. In his last two starts, he had an 8.53 ERA and 1.34 WHIP. However, on the season, he’s actually been a tad unlucky. He has a pretty poor strand rate (60.9%) and slightly elevated HR/FB rate. He is actually generating more swings and misses than normal and getting less and worse contact than is typical. Don’t get me wrong, he’s no great shakes, but he isn’t this bad. I wouldn’t go out and trade for him, but I wouldn’t be cutting bait based on a bizarre 64 innings.